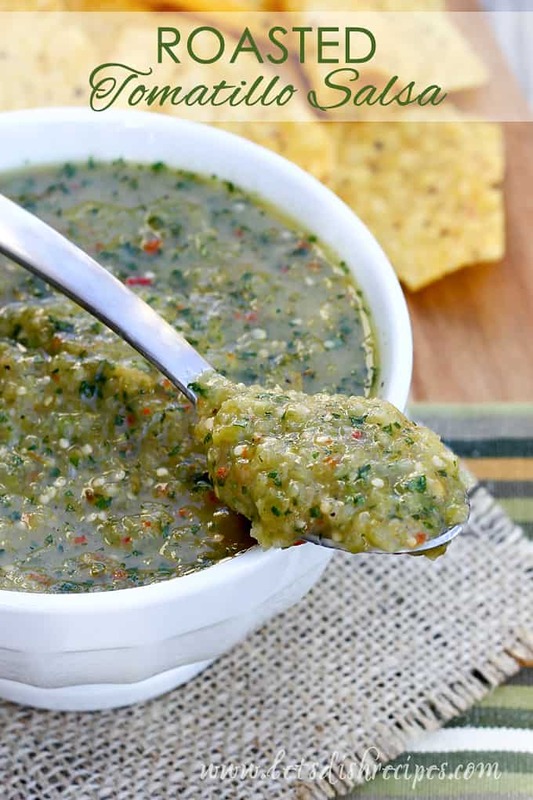 ROASTED TOMATILLO SALSA — Fresh tomatillos are roasted, them blended with jalapeno, cilantro, garlic and onion to create this mildly spicy green salsa. I was excited to spot tomatillos at my local farm stand this week. They seem to have such a short growing season here in Colorado that I can’t resist buying them when I see them. And then, of course, I couldn’t resist making some Roasted Tomatillo Salsa! One of my favorite things to do with fresh tomatillos is make green salsa. 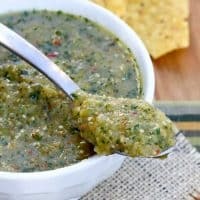 Everyone in my family prefers green salsa to the traditional red, so fresh tomatillo salsa is a big hit around here. I always roast the tomatillos first, along with some of the other salsa ingredients, to give it a bit of a smoky flavor. Once your veggies are roasted, it just takes a minute to pulse everything together in the food processor. I usually use one or two jalapenos, depending on their size and whether or not we want a spicy salsa. This tomatillo salsa is great in tacos, and burritos, or on enchiladas, but we enjoy it most with our favorite tortilla chips. 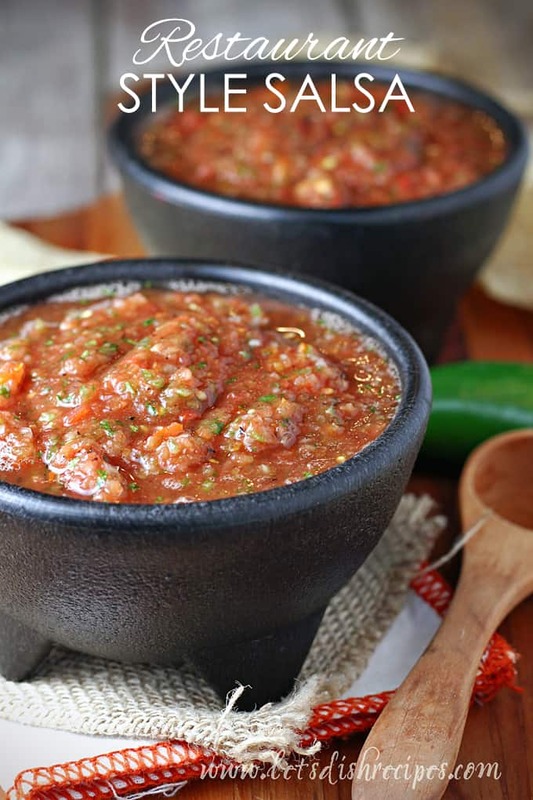 Be sure to save this Roasted Tomatillo Salsa recipe to your favorite Pinterest board for later. 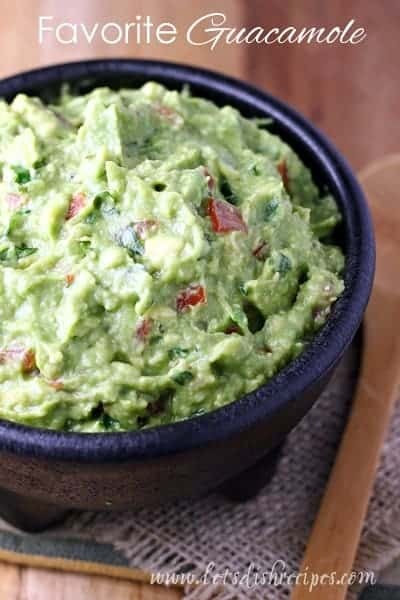 Fresh tomatillos are roasted, them blended with jalapeno, cilantro, garlic and onion to create this mildly spicy green salsa. Place tomatillos, jalapenos, onion and garlic cloves on a large baking sheet and drizzle with olive oil. Roast for 10-15 minutes or until vegetables start to brown. Remove from oven and cool. Place roasted vegetables in the bowl of a food processor and process until well blended. Add fresh cilantro and process for another minute or two. Season with salt and pepper, to taste. Who Dished It Up First: Adapted from She Wears Many Hats. Love tomatillos! Once of my favorite mexican ingredients to use! 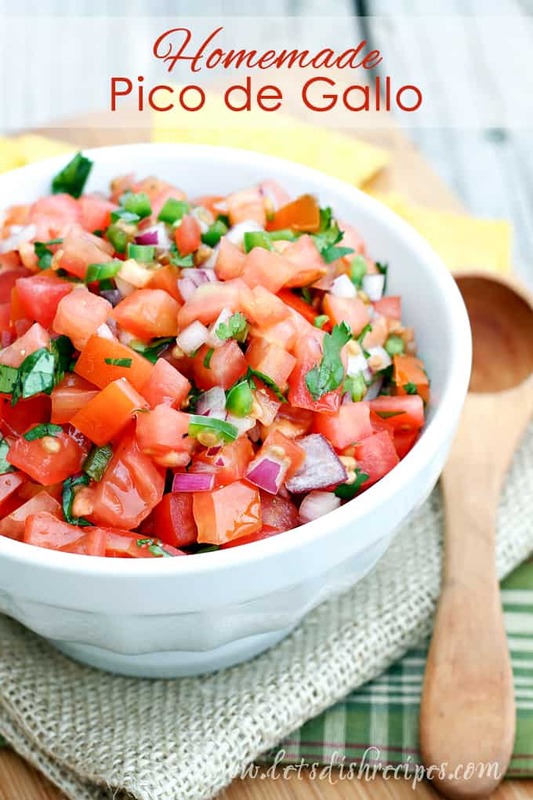 And that salsa looks SO good!